There's a rhythm and a pattern to the Tohickon Garden Club's year. We have lectures and outing, the plant sale at the arts festival in summer, a holiday luncheon in December. 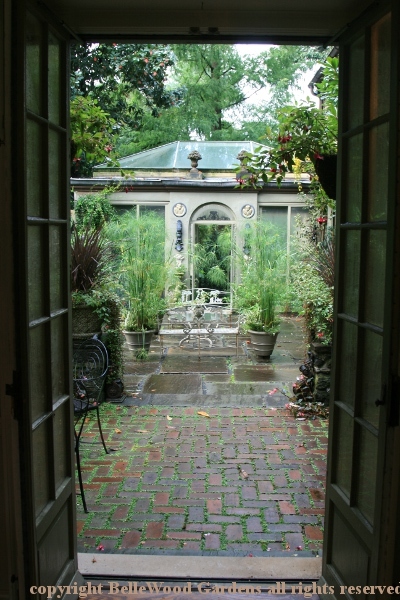 Our September meeting is an outing to Meadowbrook Farm, a PHS (that's Pennsylvania Horticultural Society) property. I've been here several times before and always enjoyed the visits. We are car pooling, and I joined two friends for the journey. What do I see, on the walk from the parking lot to the visitors center, but a concrete fruit basket. What is it this month - I espied concrete fruit bowls on my perigrinations at both Willowwood Arboretum and again at Bamboo Brook, and now here. Autumn, time of mists and fruitfulness. Just as Keats wrote. There are four womanly statues, one for each season. 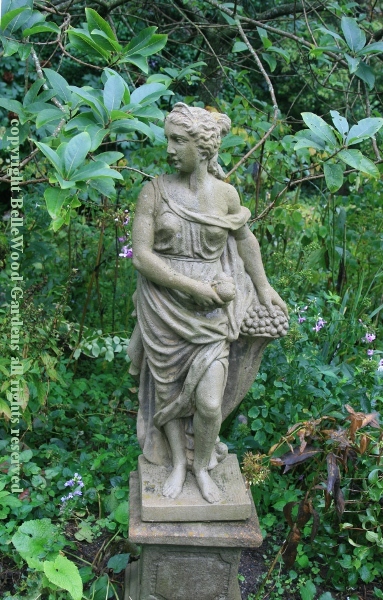 This, for autumn, must be Persephone clutching some pomegranates. We'll get back to them. 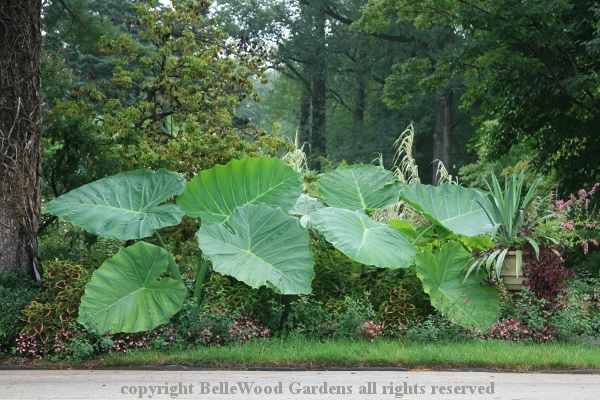 some positively ginormous elephant ears. Mastodons had small ears, so not them. 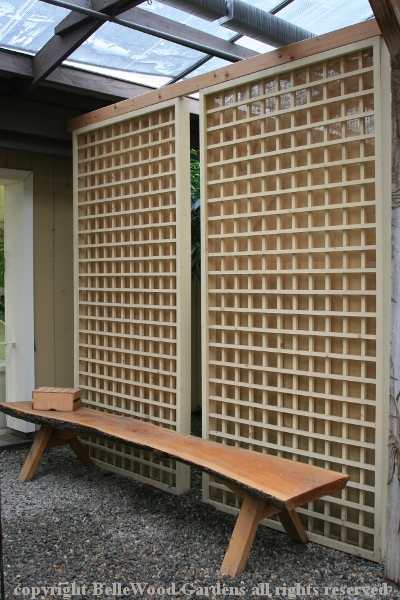 Inside the visitors center are some lovely burlap backed shoji type screens screening off the area where, later on, we'll have lunch. Our garden club group is large enough that we are separated. Each, with a docent, are off on a guided tour of house and grounds. 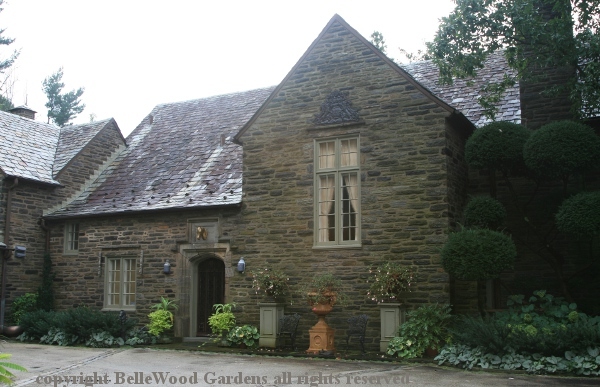 Designed in the English Cotswolds style by architect Robert McGoodwin, the house, and its furnishings were given to J. Liddon Pennock, Jr. and his wife, Alice Herkness as a wedding gift by her parents in 1936.
across the wide brick and bluestone patio to a solarium. 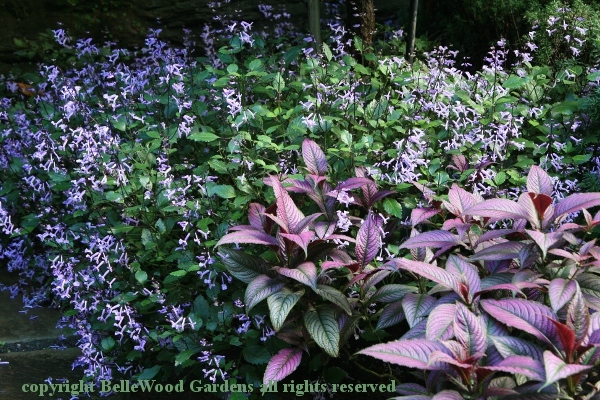 and what I have tentatively decided may be Plectranthes 'Mona Lavender'. The smaller pool, close to the house. 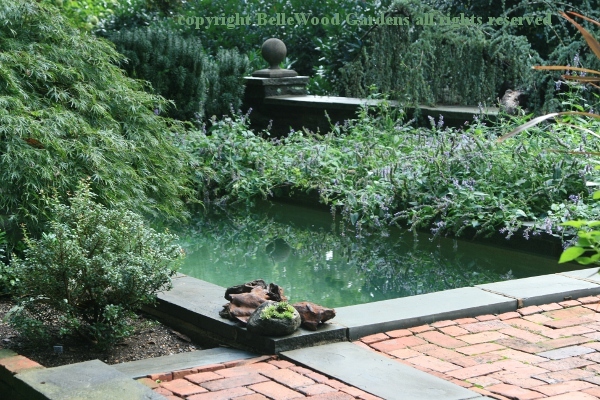 Here is where Alice used to bathe when, with age, her arthritis precluded walking to the larger one. Surrounding trees have grown taller, shading what was once open and warmed by the sun. 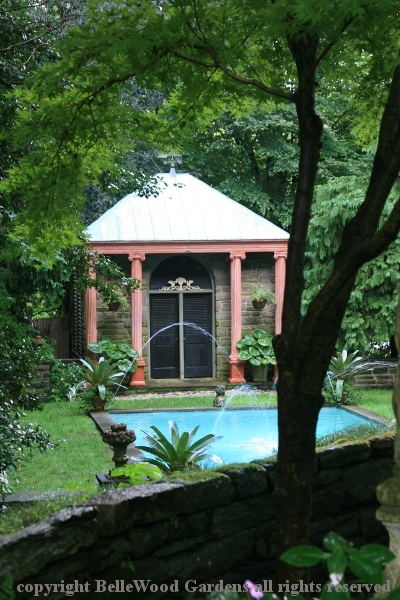 A poolside fountain. 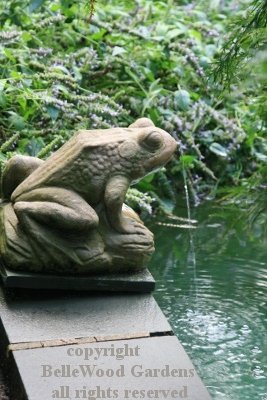 At first I thought "frog"
but the rough warty skin suggest "toad." 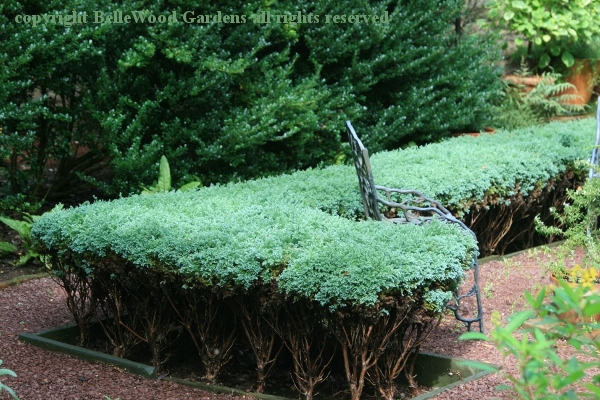 There is an herb garden. 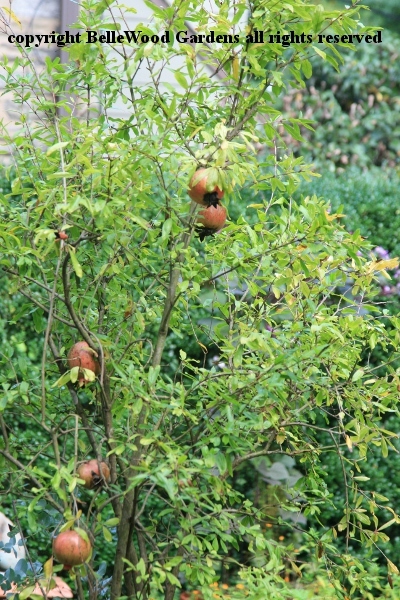 With a dwarf pomegranate tree. 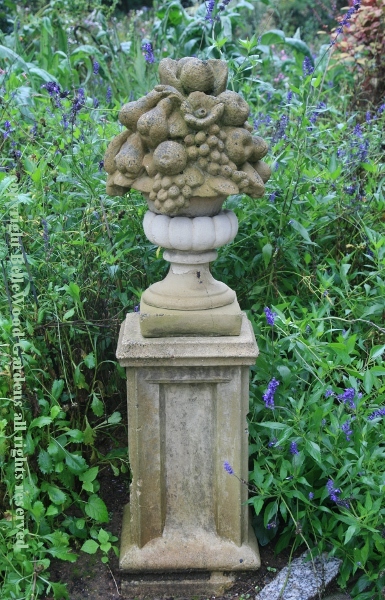 Now, remember those statues of the four seasons, and autumn with her pomegranates. Why is pomegranate associated with autumn? Hades, god of the Underworld, kidnapped Persephone and took her to the Underworld to be his wife. Her mother, Demeter, goddess of fertility, went into mourning and nothing could grow. Zeus commanded her release. But Hades tricked Persephone into eating six pomegranate seeds, and thus it was that she has to spend six months of the year in the Underworld. Which is why we have autumn and winter. giving a false sense of perspective that the garden is larger than it really is. 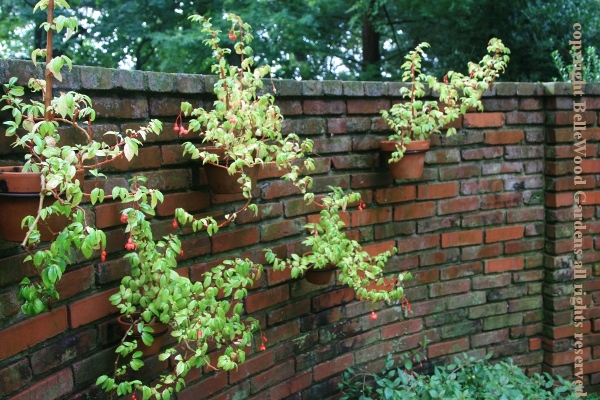 Begonia foliosa for an charming accent for summer interest. 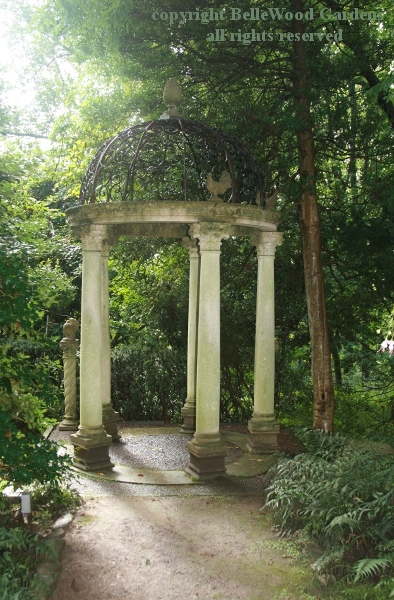 At the opposite end of the house there is a gazebo. From there, turn to the right and there is the pool house and larger pool. Our group and Clint, our docent, heed my request and pause for a photo op. 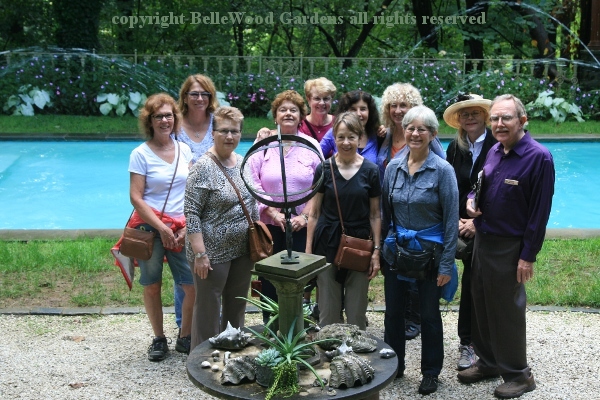 No idea where the other group and their docent are - Meadowbrook Farm is sufficiently spacious that we did not come across each other as we were leisurely, and informatively, guided through the house and around the grounds. Our tour concludes, and it's time for lunch. 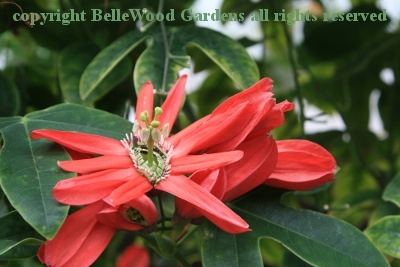 Even the dining space has its beauties, like this Passiflora rubra. too, because Meadowbrook Farm closes on September 30 until next April.